Sign up to receive monthly Catholic Holy Days Of Obligation and feast day reminders. 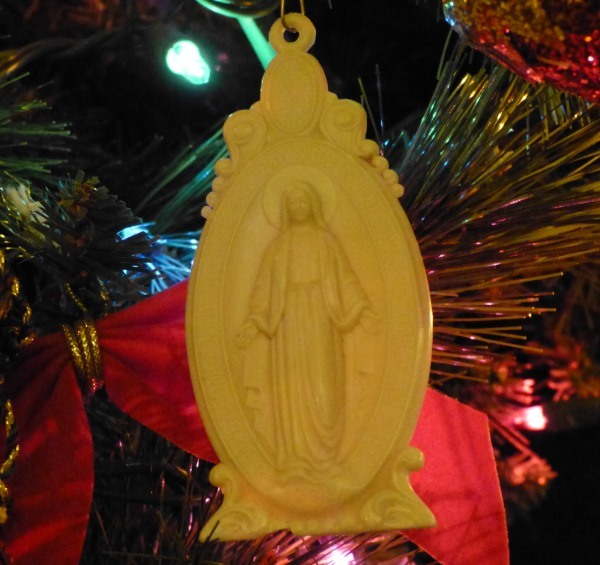 The first of the Catholic Holy Days in the USA is the Immaculate Conception, December 8. Remember the Holy Days. Ahead of time. Remember the major saints days. Remember the First Fridays and Saturdays. Sometimes the First Friday is behind the First Saturday, which is tricky to remember during that second week. This can help you schedule confessions, too. Receive next month's reminder dates in your inbox. Near monthly. 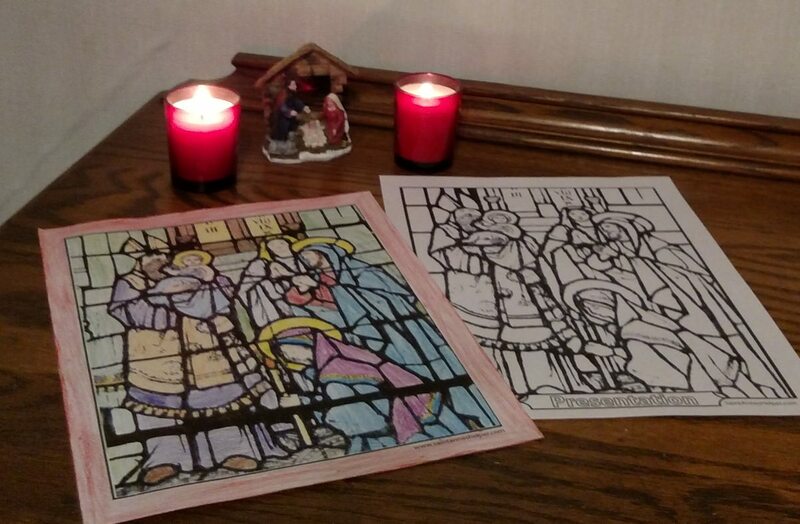 Great ideas for projects related to the liturgical calendar. In time to get ready. As the year passes, it can be easy to forget that a holy day is coming soon. 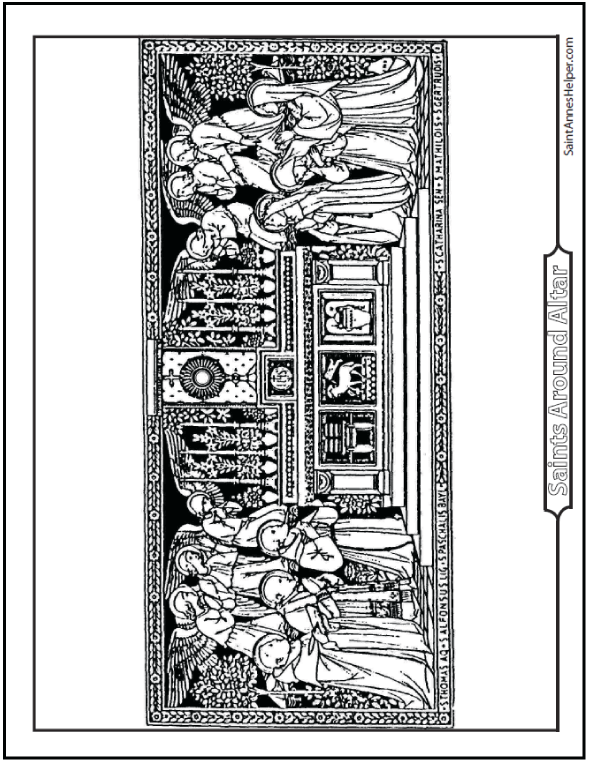 If you have reminders, you can mark the dates on your calendars and download coloring pages for the month. First Friday and First Saturday dates. I usually try to post in time for you to be able to go to Mass and confession for the First Fridays and Saturdays. If there's a Holy Day in the middle of the month, I may send another short email. I usually include a list of the major saints days for a month. 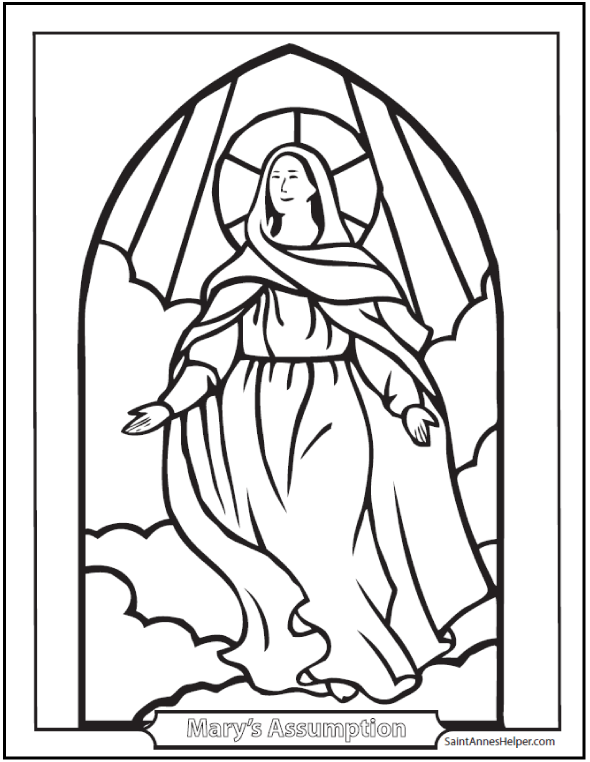 If we have Saint Anne's Helper coloring pages, I send a link to the saints of the month, the Rosary in May and October, and our downloads for back to school and homeschool planning in September and April. 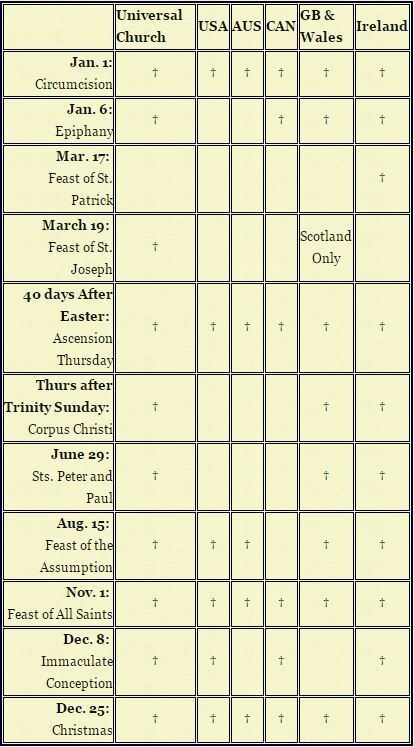 The following Catholic Holy Days of Obligation chart shows the dates for the Universal Church and for the various countries around the world. There are six Catholic Holy Days in the United States. See the Holy Day chart below. 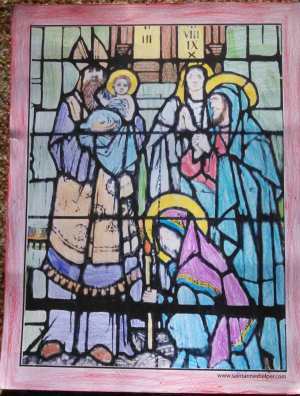 Sign up for our near monthly Holy Day Reminder newsletter ezine in the left column or on the form above. 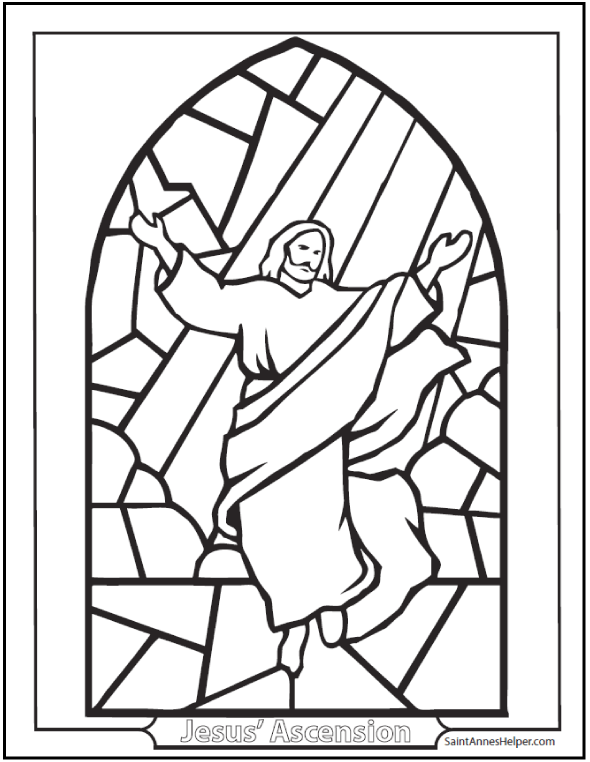 Holy Days of Obligation coloring pages. The obligations attached to the days have changed in many places which makes people think that some are no longer of obligation. In some dioceses and congregations the obligation is simply transferred to the next Sunday. Confirmation class is an important time to learn the holy days. For one thing, if one is to be an adult in the service of God, one must know his obligations amongst which are the days to keep holy as with a Sunday. If Confirmation is not until later than third to seventh grade it is good to teach the holy days when you're teaching the Third Commandment. All Sundays are holy days of obligation. Because Jesus rose from the dead on Easter Sunday and the Holy Ghost descended upon the Apostles and Mary on Pentecost Sunday, the Catholic Church has designated Sunday as the Lord's Day, not Saturday which is known in the Bible as the Sabbath. There are other very important feasts in the year that count as the Lord's Day, too. Since there are some that do not fall on Sunday, we memorize those dates so as to be able to remember them through the year. Check your local Ordo for what is required on the Holy Days in these lists. There is a list of days required in the United States below this universal chart. What Are The Catholic Holy Days Of Obligation? 1. Christmas Day, December 25. 3. Ascension Thursday, 40 Days after Easter. 4. 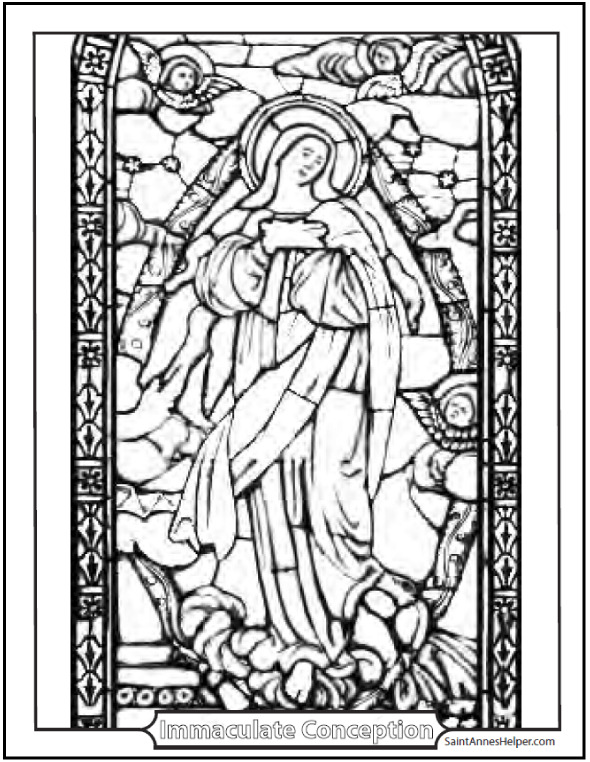 The Assumption of the Blessed Virgin Mary, August 15. 5. The Immaculate Conception, December 8. 6. All Saints Day, November 1. 1 for the other saints. All Saints Day, November 1, is the last Holy Day of Obligation in the year. 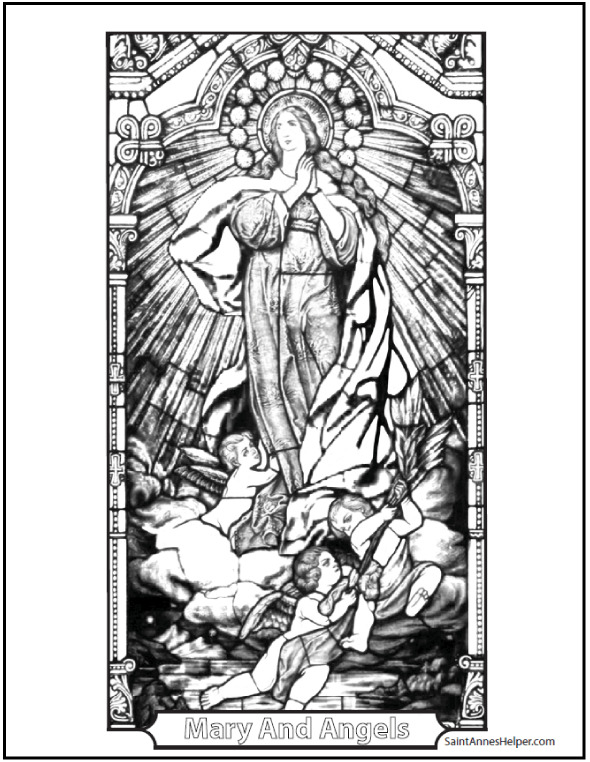 More printable Saints coloring pages. 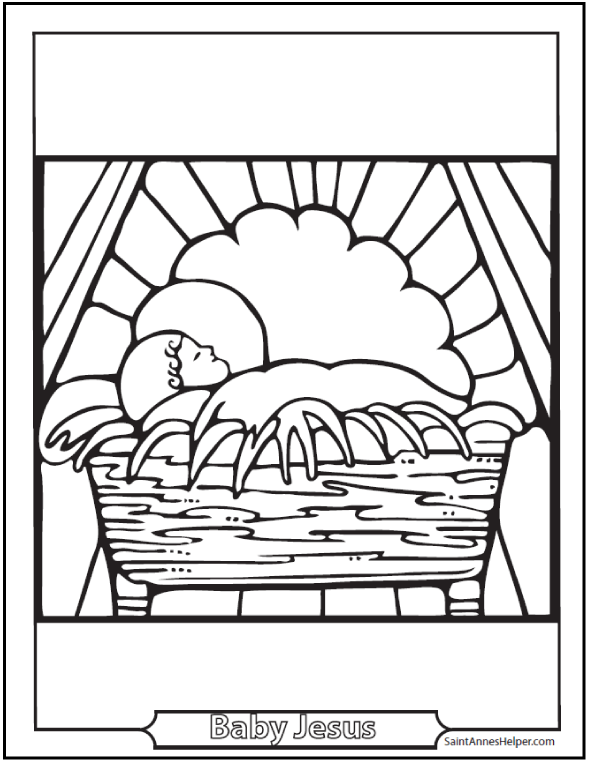 Enjoy our Immaculate Conception coloring page! 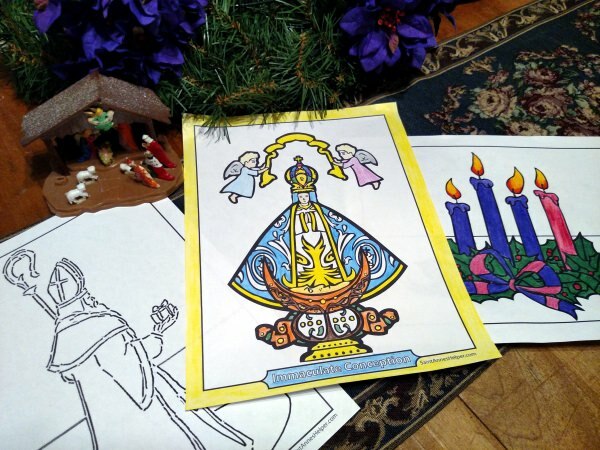 Many more printable Christmas coloring pages. There are other holy days that are important, too. They are not obligatory, but they do mark important days in the calendar. There are many Catholic Feast Days that are simply the feasts of saints and do not directly affect the Liturgical calendar, but we celebrate them in honor their virtues in imitation of Jesus and Mary like: St. Patrick, St. Joseph, St. Andrew, and St. Anthony. 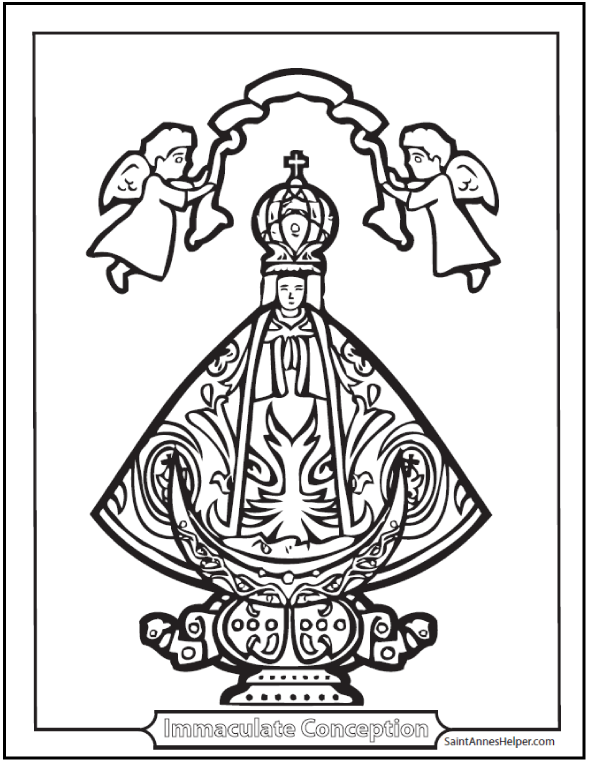 Some of these are remembered in the Rosary (see Rosary coloring pages here). Holy Saturday - Jesus remains buried. Advent - Fourth Sunday before Christmas. Since some of these dates are movable feasts so we post these dates on our home page and send an email reminder about once monthly. The Ascension is a movable feast. Do you need a Holy Day Reminder? Fill the form at the top of this page. Invite your family and friends to do the same. 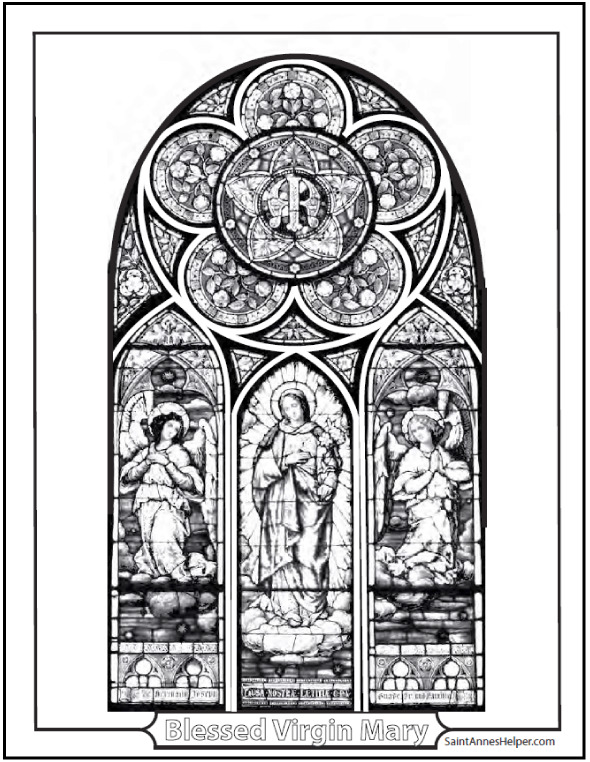 Our free monthly reminder of the Catholic holy days of obligation also mentions the dates for the nine First Fridays and the five First Saturdays. Sometimes it's tricky when the First Saturday comes before the First Friday, so it's good to have a reminder. We also mention other major Catholic feast days and seasonal highlights of the Catholic liturgical calendar. Simply enter your regular email address in the white box on most of our web pages or sign up for our Holy Day Reminder at the top of this page. 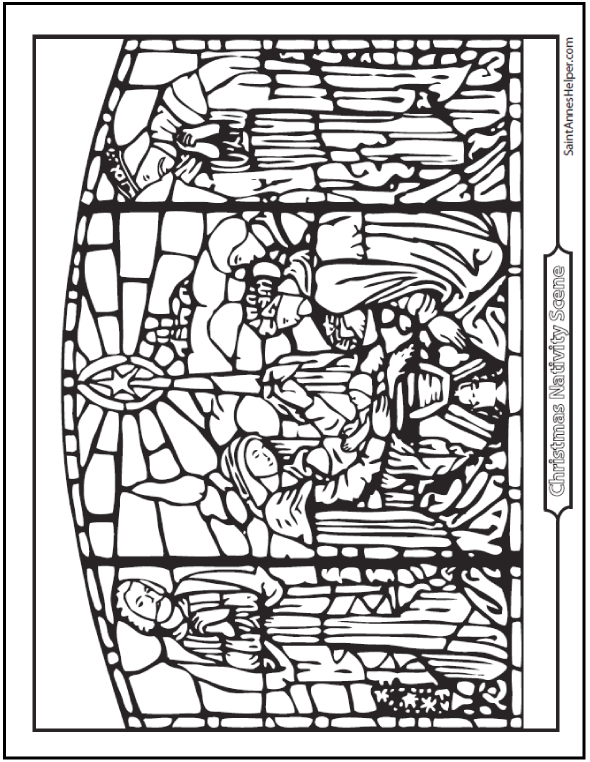 Remember to check your local Ordo for what is required on the Holy Days in your area. The Confirmation catechism is when we learn about the holy days and memorize the list. We are usually required to memorize these so that we do not forget throughout the years. 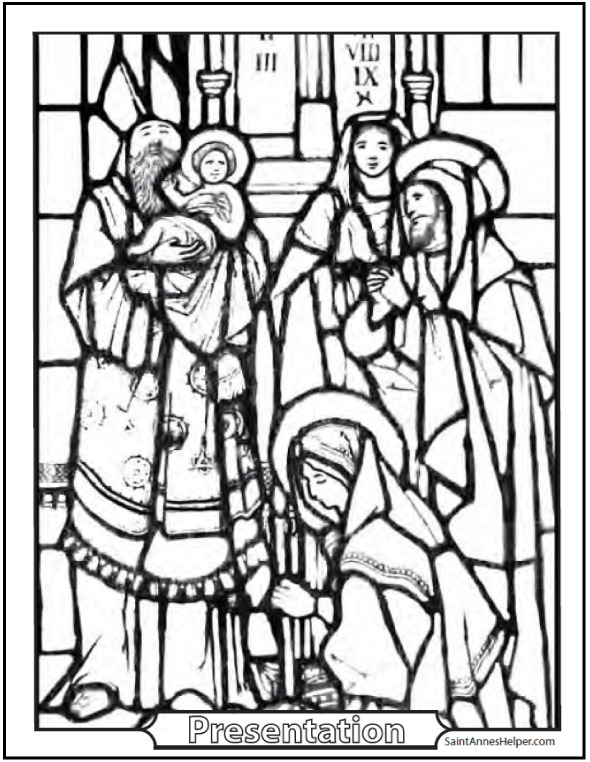 The St. Anne's Helper Catholic Confirmation catechism is an audio Baltimore Catechism that makes memorizing the holy days easy and you can find an explanation of most of the holy days, especially Christmas, the Circumcision, and the Ascension of Jesus. 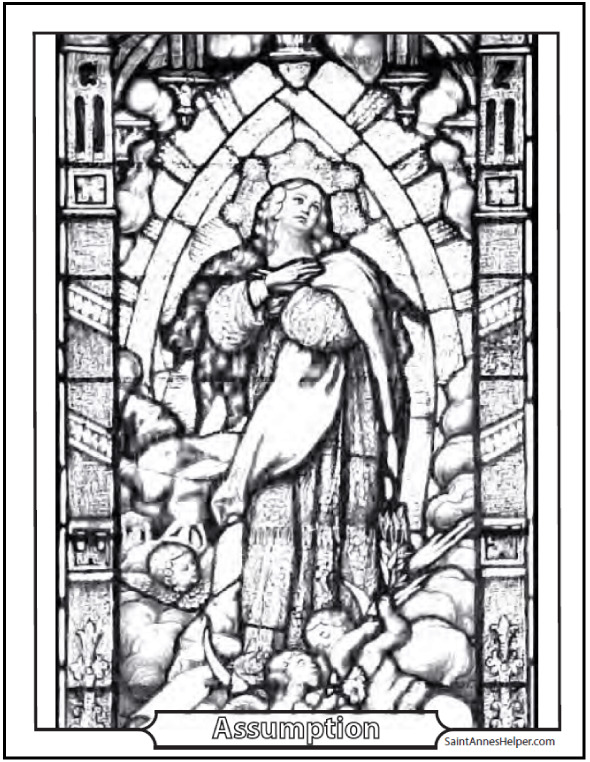 St. Anne's Audio Catechism for Confirmation teaches the Catholic Holy Days of Obligation in the USA. St. Anne's Confirmation Catechism Copybooks also reinforce learning the answers. They use the copybook method to help your children improve memorization, penmanship, reading and spelling! Practice for the quiz! The Roman Catholic calendar names the Catholic Holy Days of Obligation as well as the Catholic saints names to use for Baptism or Confirmation. It frequently has a separate list of patron saints, as well. Knowing the specific patron saint is handy for special dedications or gifts. The Catholic Encyclopedia or Butler's Lives of the Saints (not Attwater's rewrite) are great resources, too. 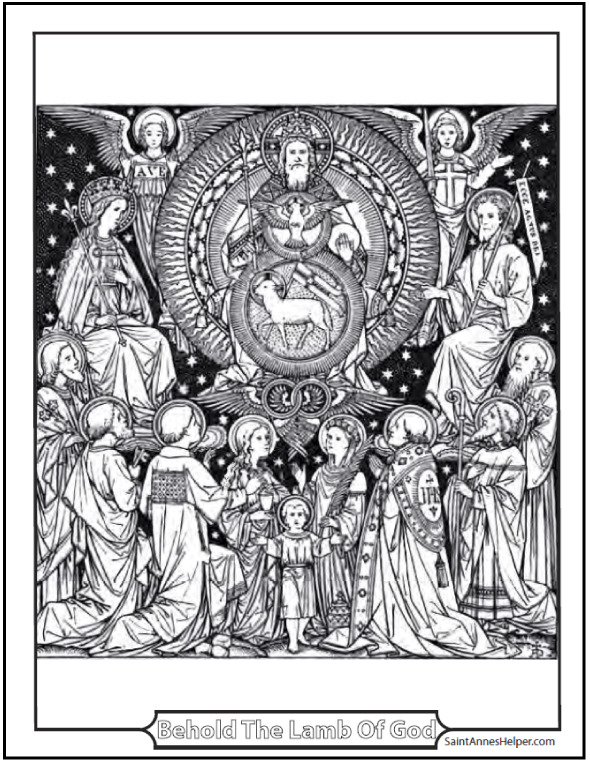 The Catholic Missal prayers, readings, and thoughts for the day are usually placed in the Catholic liturgical calendar according to the anniversary date of each saint's death. 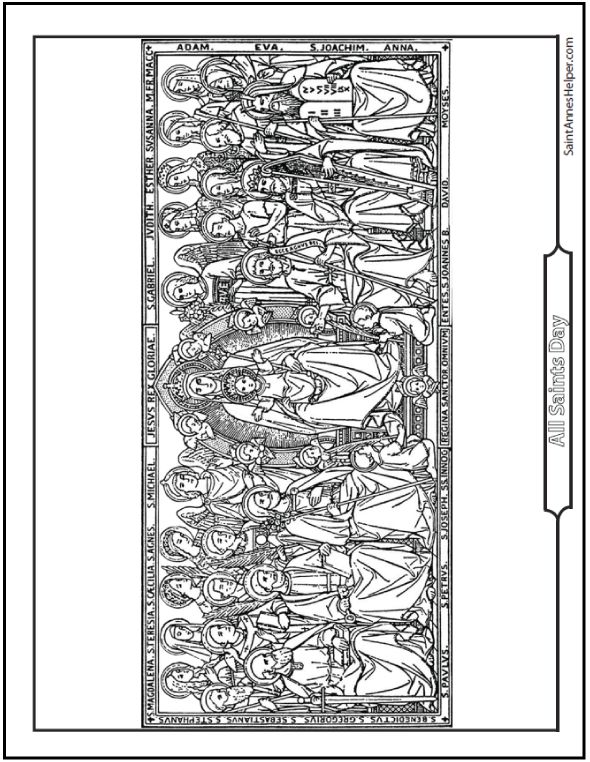 Newly canonized saints can be found on calendars that use the new liturgical year. 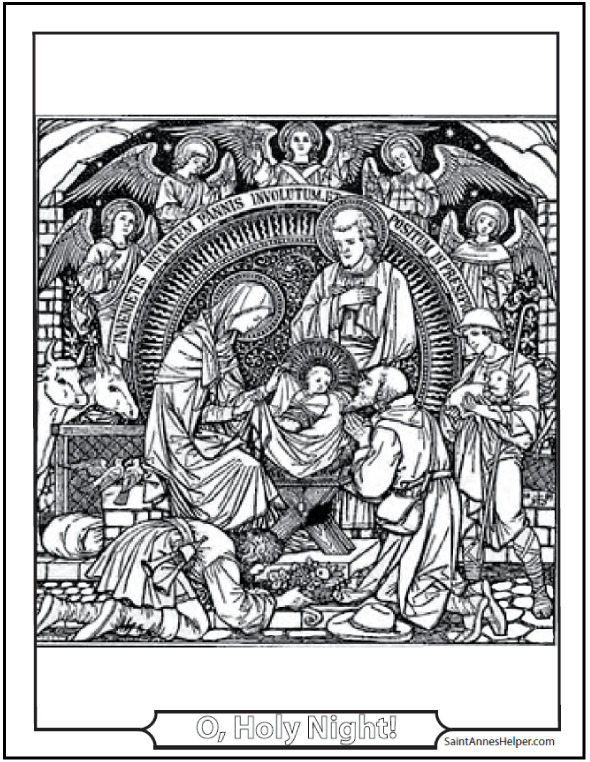 TAN Books has had a Catholic calendar that lists both the traditional Catholic calendar and the new which can be handy for comparisons. Looking for the dates of more Catholic Feast Days? Here's a great list by month according to the 1962 Catholic liturgical calendar that is used with the 1962 Roman Missal. Catholic Holy Days Of Obligation and other Catholic feast days.